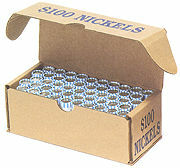 Designed to hold 50 wrapped rolls of coin, our corrugated coin boxes are perfect for storing or shipping. These sturdy boxes take only seconds to set up and are triple-banded to ensure safe shipping. They are printed in ABA standard colors and come packaged flat in quantities of 50 per bundle for convenient storage.